Queen Daisy had a great deal of trouble with her feet. They had a mind of their own and did not like behaving in a royal way. Proper shoes were out of the question, and sometimes her feet did not wear shoes at all! Her feet were especially naughty when Queen Daisy forced them to dress properly. At balls her feet would kick high in the air or tap-dance on the marble palace floors. 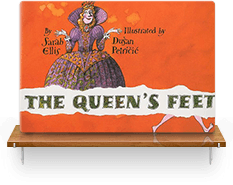 Once, when a king from a neighbouring kingdom brought his mean, bullying ways to Queen Daisy’s court, her feet hauled off and kicked the king in the ankle. That’s when a meeting had to be called of all the wise women and wizards and footmen in the kingdom to find a solution to Queen Daisy’s terrible problem. This book came from day-dreaming at meetings. Sometimes at meetings I get so restless it’s as though my feet want to walk away without me. I’ve always felt sorry for queens and such because they have to behave themselves every minute. I wondered if they got restless feet. The illustrator, Dusan Petricic, got the point of Queen Daisy perfectly. When I saw his pictures I laughed right out loud. An energetic, fun story that will tickle the restless toes of children everywhere. The slightly aghast oh-no-not-again tone of Ellis's narration is perfectly partnered with the impish sass and inspired silliness of Dusan Petricic's illustrations.